What a weekend! 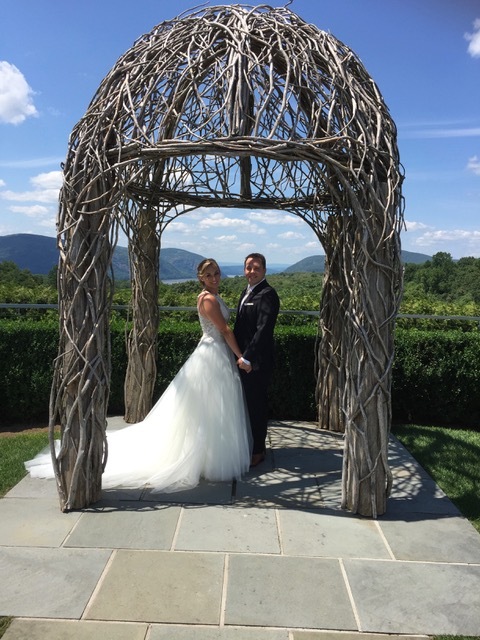 I arrived on Friday at the Marriott Spring Hill Suites in Garrison, New York to officiate the Sunday wedding between my grandson, Richie Sinoradzki and his fiance, Kristen Schmalbach. The bride had arranged for the bridal party and immediate family to have their hair styled on the second floor of the Garrison Country Club on Saturday morning. What a fun time that was. That night, Richie's father (also named Richard), and his wife, Beth, hosted a dinner party at a wonderful restaurant in Poughkeepsie, New York in honor of the bridal couple. Approximately 50 people attended. But it was more than a dinner party. Beth put together a game for all to participate. Each person was given a card that had 10 questions. Two columns, one for Richie whicht had a mustache image instead of his name, and one for Kristen which was red lips. So cute. Rich, my son (who is again the groom's father), read aloud each of the questions. We were then to mark whether the question related more to Richie or to Kristen. Whoever got all 10 correct won a gift certificate, then nine, then eight. It was a real ice breaker. Everyone was encouraged to sit with someone they didn't know. By the end of the evening, everyone knew each other. Rich and Beth presented Richie and Kristen with a large blanket made with their favorite photo on it. It was huge - the kind one might take to a football game and stay warm. I was given a beautiful silver frame with Mr. and Mrs. Sinoradzki engraved on the front. I can't wait to get to choose a photo for it. In addition, Beth had wrapping paper made where Richie's picture was inlaid throughout the paper and Kristen's picture throughout - just head shots. It was awesome! Custom made! That's Beth! Always on the ball. Needless to say, the food was excellent, and the wine was flowing. What a great start for the upcoming wedding the next day. The weather on Friday and Saturday was not the best, so a lot of praying was going on. Sunday could not have been more perfect. As you can see by the photos in the July 2017 Album on my Weddings by Phyllis Facebook page, the scenic view was outstanding. The arch for the wedding ceremony was made of tree vines. It was beautiful. One hundred guests attended. The service was very special to me because I was performing the ceremony for my grandson! What an honor! I had previously co-officiated his father's wedding ceremony to Beth some years ago. So this was doubly special! After the ceremony, a special room overlooking the scenic view held the cocktail hour. It had a number of different items, each one better than the other. In the meantime, the photographer had taken the bridal party out on the grounds for wedding photos. I can hardly wait to see them! Dinner was set for 6 pm, the DJ played awesome music, and everyone danced their hearts out! A photo stand was set up where the photographer would take three photos and immediately print them out. The bottom of the strip had Rich and Kristen automatically printed on it. What a great idea. I had four photos done with each of my sons and their wives, and three of my grandchildren. What fun! The bride and groom appeared and had their first dance. Kristen traditionally danced with her father as well as Richie with his mother. Then the bridal couple sat down for dinner and toasts at their own table that was decorated beautifully. It was very intimate. The bridal party sat with their respective families. My son, Rich, gave a speech and Kristen's two sisters also gave speeches. The best man did what a best does. And we all toasted this beautiful couple. After dancing the night away, an ice cream table was set up. The servers gave the guests the kind of ice cream desired, and we had the option of putting on a number of extras -- whipped cream, nuts, sprinkles, jelly, chocolate chips, and on and on. What a way to end the evening. Bottles of water were also handed out to guests who were leaving. What a wonderful night! Afterward, we all headed back to the Marriott to change our clothes and many of us met outside where there was a huge fire pit. Beth and Rich supplied marshmallows, sticks and whatever else goes in Smores. Everyone had a blast. My son David and I left at midnight as we had a 6:30 am flight back to Florida, but I understand many stayed out at the firepit until 3:00 a.m. Needless to say, "A great time was had by all." I can honestly say in all my years, this was the absolute best wedding I ever attended!!! God bless Richie and Kristen Sinoradzki. May their love last forever!